Spain's premier urged senators Friday to adopt radical measures to impose direct rule on rebel Catalonia and depose its president in a bid to halt the region's independence bid. Prime minister Mariano Rajoy asked parliament's upper house, where his party holds a majority, to "proceed to the dismissal of the president of the Catalan government, his vice-president and all regional ministers." The senate is scheduled to vote later Friday on measures to depose Catalonia's secessionist government before the week is out, after the region held an unlawful independence referendum on October 1. Many expect the region's separatist leaders to push back with an independence declaration. On Thursday, Catalan leader Carles Puigdemont opted not to call elections for a new regional parliament -- thought to be the only way to stave off Madrid's imminent power grab. Warning that seizure of control by the central government would escalate the crisis, he passed the buck to the regional parliament "to determine the consequences" of the threatened takeover -- thus leaving the door open for a possible independence push. 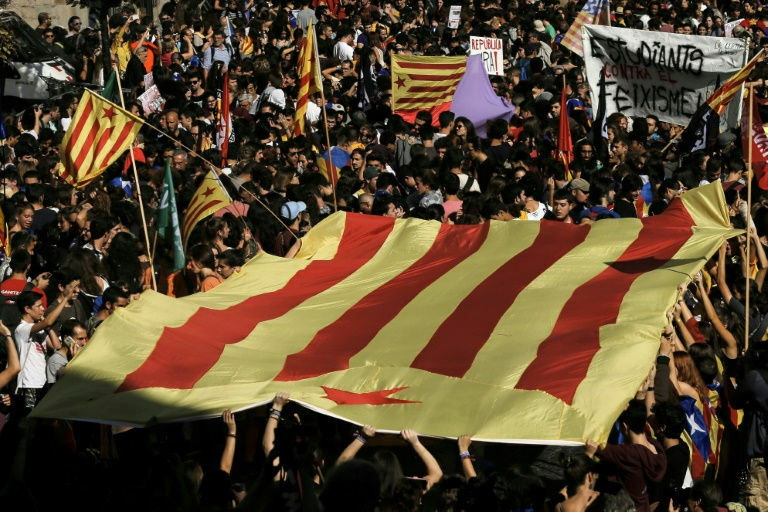 Spain and Catalonia have been locked in a constitutional standoff since a "Yes" vote in the unregulated plebiscite which secessionist leaders hold up as a popular mandate for independence for the region of 7.5 million people. Based on the vote, Puigdemont threatened a declaration of independence, which Rajoy described Friday as "a challenge of unprecedented dimensions." Madrid has turned to Article 155 of the constitution -- a never-before-used provision designed to rein in rebels among Spain's 17 regions, which enjoy varying levels of autonomy. Measures drawn up under the article are set to enter into force on Saturday, and will see the central government seek to temporarily take over Catalonia's civil service, police, purse, and public broadcaster. Deputy Prime Minister Soraya Saenz de Santamaria insisted Thursday the government was "fulfilling a legal obligation, a democratic obligation and a political obligation," by its actions. But the move is likely to anger Catalans, fiercely protective of their autonomy, even if divided on independence. Independence supporters are ready to fight back. Albert Botran, a regional lawmaker for the far-left CUP party that backs Puigdemont and wants to split from Spain, vowed Friday to "make it difficult for the new, illegitimate government to get away with it." "The first action will be resistance," he told Catalonia Radio. Catalonia's parliament met to discuss the issue late Thursday, where opposition lawmakers pleaded with Puigdemont to find a solution to the standoff closely watched by a European Union nervous wary of nationalist and secessionist sentiment, particularly after Britain's dramatic decision to leave the bloc. AFP / LLUIS GENE Catalan president Carles Puigdemont (C) opted not to call elections for a new regional parliament -- thought to be the only way to stave off Madrid's imminent power grab. "You still have time to return to legality and call elections," Ines Arrimadas, regional leader of the anti-independence Ciudadanos party, appealed. Catalans are fiercely protective of their language, culture and autonomy -- restored after the 1939-75 dictatorship of Francisco Franco. Fears for Catalonia's economy have increased as uncertainty persists over the independence drive, with some 1,600 companies having moved their legal headquarters out of the region in recent weeks. Catalonia accounts for about 16 percent of Spain's population and a fifth of its economic output. 0 Response to "Spain readies to roll back Catalonia's regional autonomy"